Whether you are looking to skip the preorder queue on the hottest selling gold iPhone 5S or looking for a cheaper way of making your iPhone 5 look like one, gold stickers offered by some smart Chinese merchants seem to be a pretty good option (via The Wall Street Journal). The cost of this cheap makeover is less than CDN $5, according to postings on Chinese retail platform taobao.com. It appears that the Chinese symbolize the gold colour as an indicator of wealth, considering the metal as a valuable asset to hold. That pretty much explains why Chinese consumers are so passionate about the gold-colored iPhone 5S. 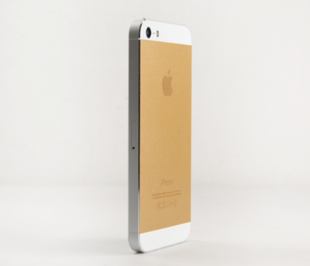 Ever since the debut of iPhone 5S, the gold version has been the most popular model for Apple’s latest flagship smartphone. It sold out in Apple’s Canada store online in less than 10 minutes after the pre-orders began.